Whether you've lived here for years or are relocating to the area for work, finding the right neighborhood is just as important as finding the right house. Everything from the proximity to schools for your children, community amenities, and the distance to work and commuter hubs are important elements to consider when you're on the hunt for a new home. If you're new to the area, one of the most challenging things can be figuring out which community will best suit your unique needs and interests. That's where we come in. Tell us about the qualities that you want and need not just in a house, but the community as well. This can include anything from top-rated schools to hiking paths, care facilities, and great shopping. Our team at My NC Homes wants to make sure that you're not just happy with the house, but you're happy with the home — because it's all of these elements combined that make it your place. 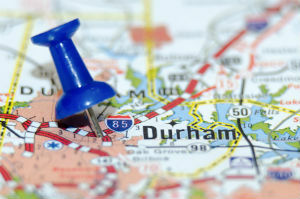 Durham is well-recognized for its research and technology roots and diverse population. Home to both Duke and North Carolina Central University, it attracts a diverse population from all across the nation and the world. Durham's population is also known for its welcoming sense of community, as most people are considered to be quite friendly. One of the best parts of living in Durham is a low cost of living which is slightly lower than the national average. Another bonus of living here is that home prices continue to increase, as many professionals and students flock to the area. In comparison to other tech-hubs like The Bay Area, the North Carolina Research Triangle real estate is affordable. Durham real estate has plenty to offer from historic homes to more modern new construction. Whatever your budget is, you'll be sure to find the perfect single-family home or a comfortable townhouse or condo in an amenity-rich master-planned community. Durham has also been ranked as being a "Foodie Mecca" here in the US, with an abundance of highly-rated eateries. If you're looking for a quick commute RTP, Raleigh or the University of North Carolina, Durham may be just what you're looking for. Northwest of Raleigh and adjacent to Durham lies Chapel Hill, considered the third leg of the Research Triangle. One of the first things you'll likely hear about Chapel Hill is about its top-rated public school system. It is also the home of the University of North Carolina's flagship campus. Residents of Chapel Hill appreciate the town for its friendly southern charm, safe atmosphere, and clean streets. Chapel Hillians are very community oriented, and it is consistently ranked as one of the top university towns in the US. Unlike it's larger neighbors, Durham and Cary, Chapel Hill is a relatively small town, with roughly 30,000 year round residents and another 28,000+/- University students. In general real estate prices as well as property taxes are somewhat higher in Chapel Hill and Carrboro, which shares the same school system. There's a wide variety of home styles, from historic mansions, to mid century moderns. You'll find estates with acreages, spacious single-family homes, and well-appointed townhomes and condos. Chapel Hill offers solid appreciation potential with such a steady flow of students, families and professionals coming in for career opportunities. Cary is the seventh largest city in North Carolina and is split up into two sides, east and west Cary. Where old meets new, the east part of the city showcases most of Cary's historic charm, while west Cary is abundant in contemporary real estate developments surrounded by convenient amenities and close to important points of interest. Cary is home to various world headquarters like Epic Games and SAS Institute. It's one of the most walkable towns in North Carolina with an extensive Greenway system offering safe, well-maintained trails and sidewalks connecting the community. Cary is the closest city out of the Triangle to the Raleigh-Durham International Airport. Due to its convenient location, and aesthetically pleasing community, Cary real estate on average is a little higher compared to Raleigh, Durham, and Chapel Hill. It has the highest median income which attracts a professional crowd from all over the world. If you fancy a historic home full of character, check east of Cary, and if you prefer a new home in a master-planned community, be sure to discover west of Cary. Overall, this affluent town offers a high caliber of real estate that often features luxury amenities and styles. Hillsborough is a favorite for many due to its location and history charm. Hillsborough homes for sale are made of a great mix of styles including well-loved heritage homes, uncomplicated single-family houses, and cozy country ranches. Hillsborough is minutes away from the I-40, Chapel Hill, Durham, RTP and the RDU. Since 2014 Hillsborough has been seeing steady growth as more young families and retirees have discovered this small gem of a town just North of Chapel Hill. Big enough to have everything you could want, but small enough to bump into your friends and neighbors is how we'd describe the lovely town of Carrboro, located right next to Chapel Hill. Carrboro real estate has plenty of diverse real estate options that will satisfy different wants and needs. Located just west of Chapel Hill, this charming community offers a village-like appeal that's full of diversity, character, and culture. Carrboro gives off a great small-town vibe but is quite densely populated. It's within close proximity to UNC and is a very walkable community. The neighborhoods are filled with a variety of single-family homes such as heritage homes, bungalows with acreages, townhomes, and traditional homes with a contemporary flair. Located roughly 15 miles due south of UNC-Chapel Hill is the historic town of Pittsboro located in Chatham County. Pittsboro offers unique shops and various restaurants in an historic downtown area. Near Jordan Lake and the Haw River—many people in Pittsboro enjoy outdoor recreation near water. With a wide variety of housing styles and affordable pricing, many find this area to offer a more relaxed, small-town lifestyle, a closeness to nature, and friendly neighborhoods. With everything you need right here in town, it's the perfect way to escape the hectic big city lifestyle, yet only half-an-hour away to get to the next big city for other necessities. The area between Pittsboro and Chapel Hill along 15-501 is among the fastest growing areas within the Research Triangle and we expect this to be the case over the next decade or so as Chatham Park. Find out more about the communities we serve by clicking on one of the community names above or search by lifestyle below. While we hope these descriptions are helpful, know that you can always reach out to us for more information or to request a showing. Contact the MyNCHome team directly at 919-659-5173 or send us a message anytime.